Why view America’s history through a T.V. 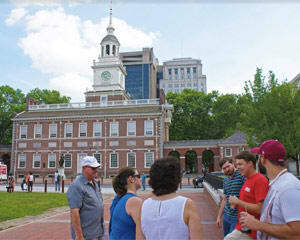 screen when you can get up close and personal with the very sites that shaped the nation on a fully-narrated Philadelphia walking tour? Why view America’s history through a T.V. screen when you can get up close and personal with the very sites that shaped the nation on a fully-narrated Philadelphia walking tour? There’s no better way to view the pivotal landmarks of one of America’s first cities than by experiencing them in person. And on this guided tour, you’ll have ample opportunity to look and learn as you roam the streets of the City of Brotherly Love. Your tour starts just down the street from Betsy Ross House, the first stop on your historical odyssey. There you’ll hear stories of the life of the seamstress creator as well as the origins of the American flag itself. From there, it’s off through the surrounding Old City neighborhood, home to the oldest continuously occupied residential street in the United States, to Christ Church, founded in 1695 and patronized by 15 signers of the Declaration of Independence, including George Washington and Benjamin Franklin! But your fabulous exploration of the Birthplace of America doesn’t end there! With your knowledgeable local guide, you’ll make your way to visit all of those unmissable Philly sights that the guidebooks only describe. Independence Mall and many, many more! Don’t just read about the birth of America, stand where its forefathers stood and hear all about the Cradle of Liberty. Join this Philadelphia history walking tour today! This is a family friendly tour and all ages are welcome! Children under the age of 6 are permitted to join this tour free of charge; please call to inform us at the time of booking if you’ll be bringing a child under the age of 6.